Peak power: 3000W. 1 3000W DC12V To AC220V Solar Inverter. - Principle: this inverter is used for changing the dc into ac. ❤ Built-in cooling fan for span life and safety use. USB output: 5VDC-2.1A/1A/2.4A/1A (4USB interface). Compatible with Parrot MKi9000 / MKi9100 / MKi9200. The microphone is compatible with the following hands free kits: Parrot MKi9000, MKi9100 and MKi9200 Bluetooth car kits. Parrot MKi9000, MKi9100, MKi9200. FOR MKi9000/ MKi9100/ MKi9200. This is a very convenient solution, especially since it can be mounted on the steering wheel or in any place. The pilot must be inserted into the possession of mounting accessories derived from a set and mounted on the steering wheel or dashboard. To listen to music from a smartphone, simply connect to the Bluetooth adapter. On the front of the Bluetooth adapter there is also a USB port so you can connect your smartphone for charging. The USB cable must be connected to power in order to use the Bluetooth adapter. Function: DVD, USB, SD, FM. Screen swivel: L/R 180°U/D 90°. No user serviceable parts inside. Refer servicing to a qualified service engineer. Car Shift Knob & Boots. Built-in FM Transmitter. Bike & Motorcycle Parts. Peak power: 3000W. 1 3000W DC12V To AC220V Solar Inverter. Style Notes:DC 12V - AC 220V. - Principle: this inverter is used for changing the dc into ac. ❤ Built-in cooling fan for span life and safety use. Audi rns-e rns vw release Removal x 4 Keys. Audi A3, S3, RS3 RNS-E. Audi A6, S6, RS6 RNS-E. Audi A4, S4, RS4 RNS-E. Audi Vehicles Stereo Release Removal x 4 Keys. 4 x REMOVAL KEYS. These are to release units with Horizontal Removal key slots in the front of the unit. AUDI CHORUS CONCERT SYMPHONY stereo removal tools. You will receive4 tools. For installation, you can either drill out the original mounting place in the glove box or run an aux cable to your desired location and tape it up behind the glove box. IF YOU DO NOT HAVE THE THE RED 4 PIN IN PLACE YOU WILL HAVE TO BUY ANOTHER AUX KIT THAT CONNECTS TO THE BACK OF THE RADIO. As you enter the risk area, your Inforad turns from green to red and if you are travelling above the permitted speed limit your Inforad warns you by flashing red. This enables its alert system to issue a warning before you reach the risk. This is cover to Parrot LCD Screen CK3100. 3.5mm Mini Jack AUX 8-Pin M-BUS Audio Input Adapter Cable for Alpine. is AUX on the Alpine for audio input from this adapter! Then use the SRC button to select the source. Your Alpine stereo will not recognize or detect the cable after plugging it. VAUXHALL ASTRA : 2004 onwards. VAUXHALL AGILA : 2000 onwards. VAUXHALL ZAFIRA : 2005 onwards. VAUXHALL VIVARO : 2001 onwards. VAUXHALL CORSA : 2003 onwards. VAUXHALL TIGRA : 2004 onwards. VAUXHALL VECTRA : 2001 onwards. Part number: 9264966. MINI - R56 LCI R55 LCI R57 LCI, R58 R59 R60 R61. AV-IN & USB Socket. Genuine MINI. Good condition. If you do not ask and the part does not fit we will not accept responsibility for the error. For Porsche for Becker. Adopt bluetooth 4.0 protocol, compatible with 2.0 3.0 4.0 other versions of bluetooth protocol. 1x bluetooth Audio Adapter cable. Can support common MP3 format audio, and also support WMA, WAV, FLAC. THIS IS THE ANSWER AND VERY HIGH QUALITY AS YOU WOULD EXPECT FROM VW AND ONLY 30CM ! IT IS A USB-A TO ANGLED APPLE LIGHTNING CABLE, LENGTH 30 CM. Upgraded rear cam, 720P provides more clear details of everything behind the car. 170 degree Wide Angle In Car Vehicle Driving DVR Recorder with G-Sensor Parking Monitor WDR Loop Recording Night Vision. First Display: 4.3 ""TFT LCD display. Special optical lens. Easy installation without damaging to any parts of the car, just disconnect the monitor on the original. IT IS REMOVED FROM BMW E70. WE WILL OF COURSE HELP AS MUCH AS WE CAN. ActiveCradle (System 9)Active cradle for iPhone 6 base plate Active Cradle Universal XXL base plate Active Cradle for Iphone 5 base plate Active cradle universal 3XL base plate. ActiveCradle (System 9)Active cradle for iPhone X Active Cradle for Iphone 6 Active Cradle for Iphone 5 Active Cradle Universal XXL Active cradle universal 3XL Active cradle for iPhone SE. 360D V7 Cobra 16 Band Car Radar Detector Laser Speed Detector With English Russian Voice Red. This Radar detector features a laser eye detector for a 360 degree. 1 x V7 Radar detector. Detects the latest pop mode radar gun (super-fast instant on mode). Connects2 part number - CTAARUSB001. (iPod/iPhone can ONLY be connected via 3.5mm AUX). NOT COMPATIBLE with ICS system in the Alfa 166. To access an external USB device via the interface simply select CDC or CD Changer mode on your stereo. ThisPeugeot Aux input adapter allows you to connect aniPod, iPhone, iPad, MP3 player, basically anything with a head-phone jack output, to Peugeot 206, 307, 406, 607 and 807 car stereo models listed below. BMW 3 Series Bluetooth streaming handsfree calls CTABMBT007 for BMW 3 Series, 5 Series, 7 Series, Mini, Compact, Z3, and Z8. BMW 3 Series Bluetooth streaming CTABMBT007 features. Connects2 part number - CTABMBT007. VW Golf Mk5 Mk6 Bluetooth Adapter for streaming handsfree calls CTAVGBT009 for VW Golf Eos Jetta Passat Polo Tiguan Touareg Touran Transporter. CTAVGBT009 VW Golg Mk5 Mk6 Bluetooth Adapter Device Compatibility. Equipped with two AdvancedSONY Exmor IMX323 sensor and efficient H.264 video coding, TOGUARD CE40 Dual Dash Cam records fast moving scenes in high speed and captures high difinition images and videos. VW Golf Aux input adapter with 3.5mm jack lead for MP3 players and iPods / iPhone connection CTVVGX004. VW Golf aux input adapter CTVVGX004 features. Part number - CTVVGX004. VW Golf aux input adapter CTVVGX004 compatibility. It is a simple snap in facia to close hole after fixed 2 DIN: DIN 2 in hole must be fill only display! VA making 2 DIN fixed as the front CAP and allows only display and pass around the 2 DIN! To install motorized Japanese or 2 DIN < span class = notranslate ' > 7 6.5 " or " made in China or Korea must be modified to have right monitor space into plastic hole. CTARNBT003 Renault Bluetooth Adapter Device Compatibility. Renault Bluetooth streaming CTARNBT003 features. Connects2 part number - CTARNBT003. Bluetooth streaming CTARNBT003. The newCTARNBT003 Connects2Bluetooth Handsfree Interface for Renault provides a versatile dual solution for your vehicle. BMW Mini USB adapter CTABMUSB007 for BMW Mini 2001 - 2006. USB input plus AUX input and SD card input. Connects2 part number - CTABMUSB007. BMW Mini USB adapter CTABMUSB007 features. BMW Mini USB adapter CTABMUSB007 compatibility. Mazda USB adapter CTAMZUSB001 for Mazda 5 and 6 approx 2006 to 2009. USB plus AUX input and SD card input. Mazda 5 and 6 USB adapter CTAMZUSB001 features. CTAMZUSB001 Mazda USB adapter simply plugs into the CD changer input at the rear of the Mazda 5 and 6 radio (see compatibility information below). 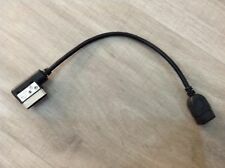 Toyota Aux input adapter with 3.5mm jack lead for MP3 players and iPods / iPhone connection CTVTYX002. Toyota aux input adapter CTVTYX002 features. Part number - CTVTYX002. Toyota aux input adapter CTVTYX002 compatibility. Screen swivel: L/R 180U/D. Car Wheel & Tyres. Car Accessories. Car Electronics. Car Stikcer. Car LED & Lights. This link is only for Grey color. Phone Accessories. Audi A4 Bluetooth music streaming handsfree calls CTAADBT003 for Audi A4 A3 A2 A6 A8 S4 and TT. Alpine Cda 9855r Head Unit- Hi-fidelity, Rare top of the range model.